Sumitomo ships ply the sea lanes of the recently completed the Oppama Shipyard which world carrying the cargoes that keep the wheels includes some of the most sophisticated ship- of industry turning. building equipment and machinery in the world. 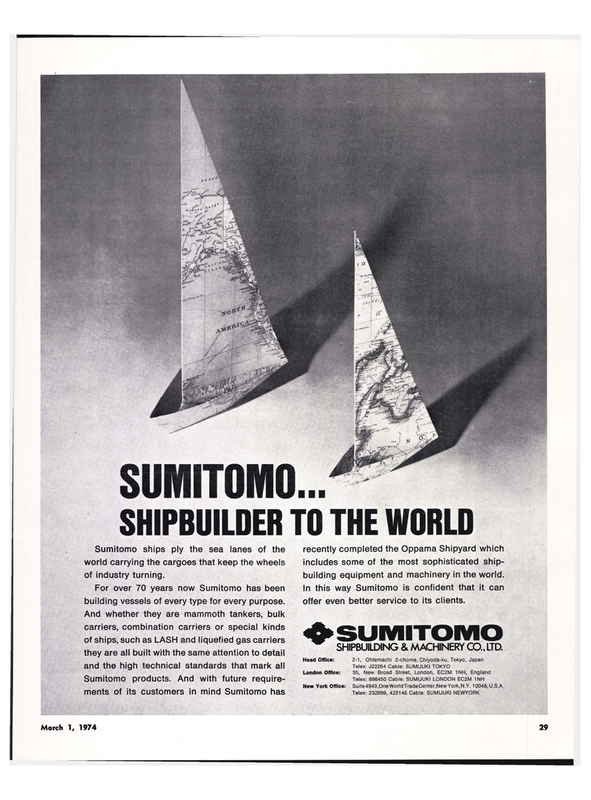 For over 70 years now Sumitomo has been In this way Sumitomo is confident that it can building vessels of every type for every purpose. offer even better service to its clients. And whether they are mammoth tankers, bulk carriers, combination carriers or special kinds ^^ • MkJH• HJI of ships, such as LASH and liquefied gas carriers • ^^IWII^Jr they are al, built with the same attention to detail SHIPBUILDING & MACHINERY CO., LTD.